Hacking a portal is the principal way to obtain items for your inventory. To hack a portal, you must stand within 40 meters of it, meaning that the portal should be inside the range circle you see on your scanner. You must also have at least 50 XM per portal level; for example, if you only have 200 XM in your reserves, you can’t hack a portal higher than level 4. Tap the portal to see its information card, then tap the “Hack” button. You can hold it down to reveal the swipe sub-menu (shown above), allowing you glyph hack, request a key, or request no key. The results of the hack are displayed in an animation, then a panel will appear displaying a list of the items you received. 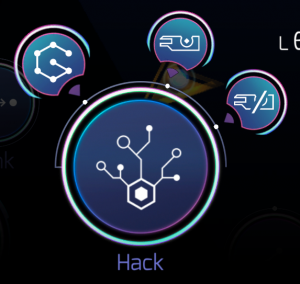 If you received bonus items from glyph hacking, the regular items are displayed first, then the bonus items. You don’t have to wait for the animation to complete; you can immediately perform another action. Any items you receive from hacking will be placed in your inventory. Friendly portals tend to give more items, while enemy portals tend to grant less (and sometimes no items at all). Neutral portals give weak items; it’s generally best to capture and upgrade them first before you hack them. If you have 2,000 or more items in your inventory, you won’t be able to hack a portal. However, if you have fewer than 2,000 items, you will be able to keep all the items you hack, even if it puts you over the 2,000 item cap. You can see how many items you have in your inventory by looking at the inventory status panel at the lower-left of your screen. Leveled items granted through hacking a claimed portal won’t be more than two levels away from the portal’s level. The distribution is a bell curve: gear at the portal’s level will be dropped regularly, gear one level away less often, and gear two levels away rarely. For example, a friendly L5 portal grants gear at levels 3 through 7, but will drop L5 gear most often. How close a portal is to the next level has no effect on the gear dropped; for example, a portal that’s one resonator away from L8 is no better than one that has all L7 resonators. Portal level does not appear to affect the drop frequency of unleveled items, regardless of rarity. You can double your hack yield from a portal by installing a portal fracker before hacking it. If you’d like to influence the hack results to get more offensive or defensive items, you can install a transmuter. Hacking enemy portals also grants you 100 AP per hack. However, they are also likely to retaliate, or “zap” you. The higher the portal’s level, the more damage it inflicts. The table below shows the damage inflicted by portal zap. Note that turrets and force amps installed on the portal may increase these values, and there is a chance that the portal may get a critical hit against you, which will double the damage. It’s not terribly advantageous to hack portals that are much higher level than you, since they will zap you hard and you can’t use the leveled items they give you (although you can recycle them or give them other agents). Hacks can also help you earn your Explorer, Hacker and Sojourner medals. A portal will go into a five-minute cooldown period after you hack it. If you attempt to hack the portal again during the cooldown period, you will get a message saying that the portal is “running hot” and the hack will fail. The cooldown status of a portal is per-agent; other agents can still hack the portal. Heat sinks reduce a portal’s cooldown time, allowing you to hack it more frequently. They also reset the portal’s cooldown timer and burnout hack counts to zero, allowing you to hack the portal again immediately after a heat sink is installed. A portal will be “burned out” if you have hacked it four times in the last four hours; you won’t be able to hack it again until enough time passes that a hack drops out of the four-hour window. Like cooldown, the burnout status of a portal is per-agent; other agents can still hack the portal. Multi-hacks can increase the number of hacks before burnout, but do not reset the cooldown timer or burnout hack count like heat sinks do. Portals—especially enemy portals—sometimes won’t grant any gear. This isn’t really a failed hack (it triggers the cooldown timer and counts towards stats); you just didn’t get any gear for it. If you move (or drift) more than 40 meters away from the portal before hacking, you’ll be told you’re out of range. Move closer and try again. Attempting to hack while a portal is in cooldown or burnout will fail. Wait for the time to elapse or install a heat sink, then hack again. If you have 2,000 or more items in your inventory, the hack will fail. Use, recycle, or drop some items and try again. If your previous action was less than 30 minutes ago, but you are far enough away from your previous action that your average travel speed would have exceeded 60 kph (37 mph), the hack will fail due to speedlock. Wait a bit and try again. If you experience a network or GPS connectivity issue on hacking, the hack will fail. Verify your connection status and try again. If you have any doubt whether the hack was counted in your stats and want to be certain (for the Sojourner medal, for example), simply hack again. Note that glyph hacking puts a message in your comm panel that confirms the hack, so you can verify that it did in fact register with the server. Swipe up from the “Hack” button instead of tapping it. Enter the MORE command glyph before a glyph hack. It should also be noted that portal frackers duplicate hacked keys. The Hacker and Explorer medals, which reward hacking, were released on 12 September 2013. The glyph hacking feature was released on 18 February 2014. On 6 March 2015, the Sojourner medal was released, which rewards hacking every day, with a corresponding “longest hacking streak” stat on the agent profile screen. A stat showing the current hacking streak was added on 30 April 2015. Wear OS support for hacking was added on 14 July 2015. Ingress Prime was released on 5 November 2018, but changes to the basic hacking mechanic were only cosmetic. However, Wear OS support was removed.